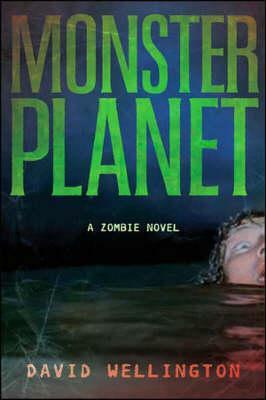 Set twelve years after the shambling zombie masses have overrun Manhattan, America, and the world, Monster Planet is the mind-blowing conclusion to what must be the scariest trilogy ever. Oceans of blood, scattered limbs, wanton violence, and general mayhem abound, along with revivified mummies, a Welsh sorcerer, and Wellington's signature brand of cool high-tech weaponry and sly humour , zombies, after all, are the ultimate consumers. What do the undead want, aside from fresh meat? Do the steadily diminishing number of humans who have somehow managed to survive over a decade of living hell stand a chance on a planet where they've been reduced to the status of prey? It all ends here, on Monster Planet. "Glorious and grisly....Click over and feast with the undead, you won't be left unsatiated." "Excellent....It's got all the stuff a zombie aficionado wants...plus a lot of welcome surprises that add a level of richness to the genre." "Page by page, the story is inventive and exciting as Wellington exploits his familiarity with New York's nooks and crannies as settings for flesh-chomping battles and narrow escapes....The novel offers some provocative thoughts about the purpose of life and death underlaid with some ultra-dark humor." "This is a zombie novel--a fantastic zombie novel....The questers get ringside seats for some of the apocalypse's finest moments, and no matter how prepared they thought they were, something worse awaits in the depths of New York....There are many layers to this zombie apocalypse, and this book just gets things rolling. Stay tuned." David Wellington was born in Pittsburgh, Pennsylvania in 1971. He attended Penn State and received there an MFA in creative writing. He works as an archivist for the United Nations in New York City. In 2003 he began work on the website www.monsternovel.com", where his novel Monster Island was serialized on-line over the course of five months and quickly became an internet cult phenomenon.